Cool backpacks come and go, but the Tina Backpack is forever. Cue the oohh's and aahh's because this stylish laptop backpack is adorned with our durable crinkle nylon, outfitted with gold zippers, and decorated with patent trim. Tina is a versatile laptop backpack that is ideal for school, work, or travel. With a roomy interior and protective laptop sleeve, this is the perfect school book bag for students carrying notebooks, textbooks, and a laptop. Plus, features like a trolly sleeve, water bottle pockets, and front pockets that offer quick access to your cell, ID, and a tablet, make Tina one of our most popular travel backpacks. Dimensions: 13" 16.75" x 7"
The backpack arrived when I already leaved the country.. I have to pay an extra shipping fee because of your incompetence. I’m in love with my backpack. Love the color, functionality, quality, comfort, and it’s just gorgeous. I am a train commuter and it doesn’t look childish or too manly for an office woman in her 30s. The gold hardware gives it just the right amount of sophistication for the office. I knocked it down a star because I would love to see some smaller internal pockets within the front zip compartment. Things get lost in there easily but that’s a testament to how much it holds and it’s so lightweight. What would be awesome is a media pocket, something you can loop a wire through to charge your phone (or a built in charger?? Too much???) without leaving it unzipped. Great quality as well! Great value, very happy!!! My Daughter love it, very nice back pack, great style, great quality, great warranty. 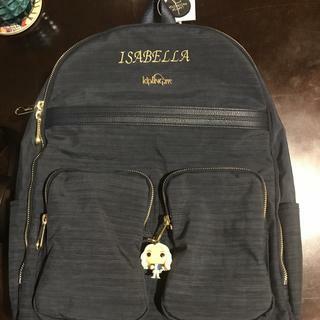 My Daughter loves this backpack, it’s very nice, great quality. Laptop and bookbag with pretty color. I have this one in the blush color and i love it....so I wanted another one in a different color! I love this backpack because it has a lot of pockets and a lot of space. I carry a lot of stuff everyday to college and having it all in my purse is a little heavy. I also LOVE the color and LOVE that it has a key holder (because they're always lost in the bottom of my purse). The feature for the luggage is AWESOME! Color, model, size perfect for my teen daugther. I wanted a new backpack for my daughter because her old one faded away and it had marks over it and it is also going to be her birthday. It has TONS of pockets and zips! Not to mention the two side pockets. It's water resistant and super cute! Perfect for college! it all came down to how many compartments it had. What type of material is this? This bag is crinkled nylon with patent vegan trim! I love this backpack so much! It's very cute and stylish. I bought the antique rose one since it's my favorite color and I expected it to be more rose gold but in person it's more mauve/light purple. That's the only reason why I would rate it a 4 but I still love the backpack very much! Great backpack. Very beautiful and well-made. I ordered the "deep plum" backpack, expecting the color to be as shown in the picture (a sort of wine color). However, I got a much more deep purple backpack. The new color is also pretty, it just isn't what was advertised or what I was expecting. It was time to get rid of my old Kipling bag that I have had for over 10 years! Looking forward to many years with my new backpack! I'm using this as my school backpack. It's stylish, light, well made and pretty comfortable. I love the pockets! Only con would be the price but if it lasts about 5 years, it's a pretty good deal. I just bought this so I can't comment on that. This is a great backpack. I have been using it for school and work. It's color is perfect. The only thing I was bummed about was that it didn't come with the Kipling keychain. But overall I would purchase again. It's so lovely I would buy this again and again. It's perfect for me to go to work. It's a little bit bigger than I thought, but it's no problem.